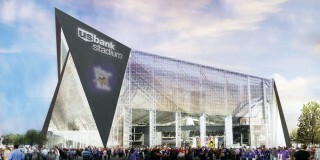 Home of the National Football League’s Minnesota Vikings, and site of the 2018 Super Bowl, this 1.75 million square foot multipurpose stadium that is currently under construction will boast 65,400 seats, 116 suites with 8,000 club seats, end zone high quality HD video boards, 800 flat screen TV’s and capability to host more events than any other large stadium in the world, including MLS Soccer, NCAA basketball and baseball, motocross, concerts, conventions and marching band competitions. The structure itself includes the lightest and most efficient roof structure in the nation allowing for a connection to the outdoors from a climate controlled environment. 650 LT Liquid Adhesive – Used to prime all structural concrete, masonry, insulation or wood surfaces prior to membrane installation.